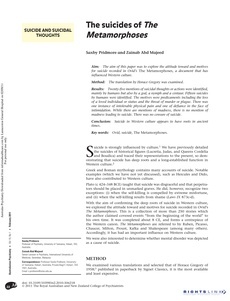 Aim: The aim of this paper was to explore the attitude toward and motives for suicide recorded in Ovid ’ s The Metamorphoses , a document that has infl uenced Western culture. Method: The translation by Horace Gregory was examined. Results: Twenty-fi ve mentions of suicidal thoughts or actions were identifi ed, mainly by humans but also by a god, a nymph and a centaur. Fifteen suicides by humans were identifi ed. The motives were predicaments including the loss of a loved individual or status and the threat of murder or plague. There was one instance of intolerable physical pain and one of defi ance in the face of intimidation. While there are mentions of madness, there is no mention of madness leading to suicide. There was no censure of suicide. Conclusion: Suicide in Western culture appears to have roots in ancient times.